The All Pine Inn – 4bd/2ba, 2000 sq ft. Sleeps 12. Walk to downtown. All rooms are nicely decorated. This 4 Bedroom home has three-levels, two baths, & three decks, two looking out the front of the house. Open floor plan, with Cozy Swedish fireplace on main floor living room and 50" flat screen with DirecTV & VCR/DVD Player. Large collections of movies, books and games for all ages as well. Front door opens to the main level of cabin. View from dining to kitchen and living room. Kitchen window eyes view of downtown Wrightwood. All 4 Bedrooms have Cal King beds. Master Bedroom is located on main floor with lighted vanity & small balcony, adjacent to full bathroom. Second Bedroom on main floor. Upstairs are two more bedrooms, (one with front birds eye deck) and one with a large walk-in closet. The upstairs bathroom serves those two bedrooms. Lower Level has easy entry service door into Laundry/Mud Room with full sized washer/dryer and supplies. Bottom level has large family/game room with pool table and big-screen. Throughout the house is a good selection of books to view and read for all ages. 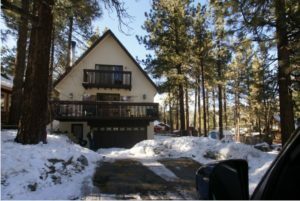 The Getaway Chalet – 3bd/2ba, 1700 sq ft. Sleeps up to 12. Backs to Forest. This 3 bedroom, 2 bath home, has exceptionally large bedrooms. It's a split level, 2 bedrooms up, master down, with living quarters on the main level. It has a great room concept in that the Kitchen, Dining and Living Rooms are open to each other. It has three decks, one is so large it covers an entire two car garage and has a outdoor patio furniture for dining or relaxing. The home also is quite private, as it backs to the forest. It's ideal for six adults but can accommodate 8 or 10 without issue. 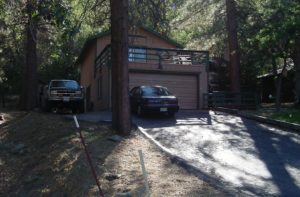 I understand it is the most popular/requested rental in Wrightwood. All things are provided, excepting sheets and towels, which are offered at added charge. DirecTV TV(2), DYD/VCR, a fully stocked kitchen, with Microwave and D/W. Popular Games are under the front breakfast counter, kids toys are in the third bedroom. Books/DVD/VHS for all ages. The fireplace can burn logs,(bring your own wood), but it's also set up with gas. It's an easy walk to town, although the walk home is mostly uphill. The ski lodges are within 5 minutes. The Snow Bungalow - 2bd/1ba Sleeps up to 7. One block to town. Located high in the San Gabriel Mountains, yet an easy drive from anywhere in Southern California, is the Snow Bungalow. Mountain High Ski Resort is approximately a five-minute drive from the cabin. The cabin is location 1 block from the quaint village. This cabin has 2 bedrooms (1 double bed, 1 queen bed), 1 full-bath, is furnished and equipped with a kitchen and fireplace. In addition, there is a full & twin sized futon sofa sleepers located in the family room. Everything is supplied in the kitchen, including dishes, pots and pans, silverware, and for housekeeping & cleaning articles. The cabin also has a fire log or wood-burning fireplace. In addition, the cabin has a DirecTV, VCR, CD & large screen television, microwave and washer/dryer w/ supplies. Games, Videos & Books for all ages in stock as well. Renters must bring their own linens and bedding (towels for bathroom and kitchen, sheets, pillowcases, blankets), or it will be provided for an additional fee. 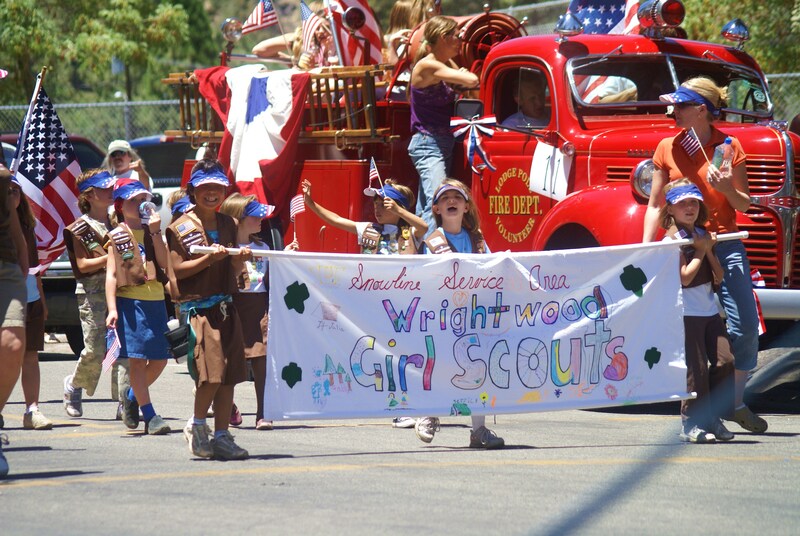 Wrightwood is a Southern California four season getaway, hidden on the back side of the San Gabriel Mountains, straddling the Los Angeles and San Bernardino county line. The village of Wrightwood (pop. 5000) in located in the midst of a National Forest, where time slows down - there are no stoplights, no chain restaurants, and elementary school kids still walk to school, (yes, even in the snow). Our Homes are fully furnished and ready to enjoy. The All Pine Inn and Snow Bungalow are within block of the quaint village, and the Getaway Chalet is within walking distance. 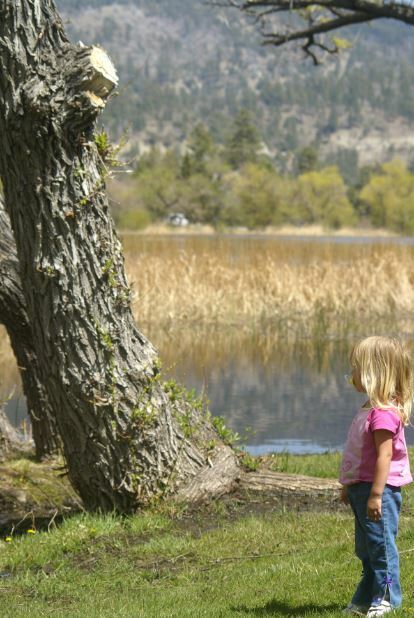 All of the homes are five minutes from Mountain High Ski Resort. If you're planning winter ski or snowboarding fun at Mountain High, or looking to zip line and canopy walk at Big Pines Zip Lines, getting there from town is only minutes away, which is only an hour from Orange County. Summer Festivals are almost weekly, mountain hiking and biking trails abound, and the Angeles Forest provides the backdrop to countless weddings, birthdays and anniversaries. So skip the traffic, stay local. Enjoy a little R & R, with nights spent under a sky filed with stars.